Condensation forms on your window when the surface temperature of the glass drops lower than the surrounding temperature. This occurs when your window glass is a poor performer for your climate. Your window glass lets the cold outside temperature through your windows, causing condensation to form. We can prevent this from happening with our replacement windows. 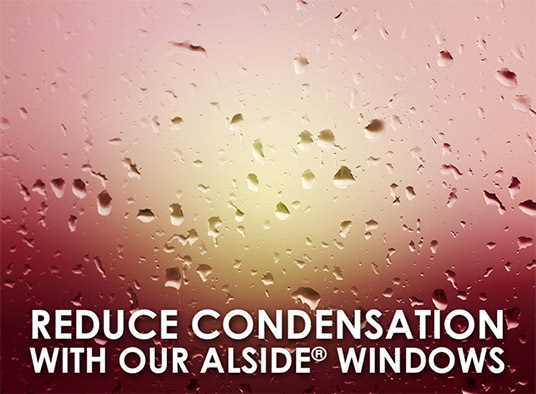 Our Alside® windows can create an effective barrier against cold temperatures and prevent condensation. Our replacement windows in Detroit feature ClimaTech high-performance insulated glass packages. ClimaTech insulated glass has multi-layer low-emissivity coatings that prevent heat loss. This keeps your interior glass surface warm and protects it from condensation. Our windows also feature the Intercept® Warm-Edge Spacer System that creates an effective thermal barrier. Its unique U-channel, one-piece metal alloy design reduces conducted heat loss from your window. Alside windows are incredibly strong and durable. For instance, their UltraMaxx® windows feature fusion-welded frames and sashes. These provide superior structural strength and form a durable barrier against moisture and air infiltration. They also have Quad 4 weatherstripping to improve weather resistance further. In addition, the heavy-duty SteelForce™ reinforcement makes the window more reliable. Lastly, a full-capture sill channels water to your exterior and keeps your windows free from debris and water. Kroll Construction is the number one choice for replacement windows in Michigan. We’ve helped homeowners for over 50 years, and we owe our success to quality products and service. Our windows will reduce excessive condensation, save you money on energy bills, and make your home warmer and more comfortable. Call us at (888) 338-6340 to learn more about our replacement windows. You can also request a free replacement windows estimate.